The Boxing Day/New Year’s Day derby exchange is implemented in many leagues, and while it never used to be this way in the Southern League, we’re getting used to it in the Conference South. Bognor on Boxing Day? I can think of worse things. No, really! Nyewood Lane has a wide open terrace with picnic benches on it, which I quite like the idea of even if during the first half today, while we shoot toward it, heavy drizzle ruins the effect. While being a bit remote in the old Southern League, which at times stretched from Folkestone to Tiverton and Merthyr to Boston, H&W are now spoilt for choice for ‘derby’ fixtures, with Eastleigh, Farnborough, Basingstoke as well as Bognor and ourselves making up the central southern belt of the newly formed division. Back in the old hierarchy, all those other clubs were in the Ryman strand of the pyramid and, as such, it is old Dr Martens clubs like Weymouth, and only Weymouth pretty much, who provoke the ire within the H&W brethren. Bognor is less than 20 miles from Havant and, in theory, should be the focus for all the bitterness those so inclined would wish to project on an opposing club, but there’s no history there, and as such our Christmas fixtures pass without any problem and today with a disappointing attendance, considering. Aside from a 4-0 win for the Hawks in the FA Cup 2 seasons ago, most games between the sides, including the pre-season friendlies that occurred prior to our union in the Conference South, have ended in stalemate. I expected, and would have settled for as much today, especially with our top scorer Rocky Baptiste suspended. On the bright side, the Rocks’ golden-booted Luke Nightingale was also forced to sit out. 0-0 written all over then, and come the half-time interval, such a predicition appears to be reinforced. Plenty of decent approach play from both sides, but with nothing that really causes much panic in either camp. Attacking the covered end in the second half which, naturally, sees a cessation in the clouds’ inhospitable spitty-fit, it is H&W who look the slightly more impressive going forward, but the game is peppered by stoppages for treatment, and no real pressure can be built up in this stop-start environment. The first moment of real interest in this typically dull derby comes with 15 remaining. A late tackle from an under-par Brett Poate is wild enough to warrant a caution and, being his second, he doesn’t wait around for the over-eager ref to scramble around for the red card that appears to be caught on the lining of his back pocket. Down to ten men, the word on the terraces is “lets dig in and hold out for a point”, but some of our players aren’t reading from that semi-defeatist script. Three minutes later and despite the deficit in personnel, the Hawks are awarded a corner-kick, Bognor keeper Craig Stoner forced into spooning the ball behind. The delivery is ideal, curving into the 6-yard box where striker Carl Wilson-Denis is on hand to beat Stoner to it with a header that sends the ball defiantly in, and after wearied disappointment comes incredible delirium amongst the away support. For the double-barrelled dynamo, it is an ideal return for his efforts during the course of the game, as well as being one more in the eye for the many critics whose words have rung in his ears on departure from his previous two Conference South stops off, Newport County and Carshalton Athletic. Indeed, H&W were laughed at for taking a punt on CW-D, and an online posting from a Carshalton fan a couple of weeks before we snapped him up tells a story, “Actually he (Wilson-Denis) wasn’t on the pitch yesterday, so about as threatening to the oppo’s goal as usual”. In the 5 games since coming to us, wrapped up in the discordant tune of a chorus of derision, he has now scored 4 goals causing widespread disbelief in Gwent, Surrey and pretty much everywhere south of Cambridgeshire. It is a fairly tough slog thereafter, but for some it has been that way since the break, Robbie Pethick spending the second half looking each of his 36 years, every tackle about as well timed as an over-written double-entendre in an under-rehearsed village hall panto. Indeed when he gets booked near to the end of normal time, the surprise is not that he has seen yellow, but that it has taken the referee so long to notice him sailing along the oily surface capturing a variety of Bognor legs in his considerable undertow. The ball happily trundling off at a 90° angle to another freshly-dug trough finally alerts the man in black to Robbie’s rather industrial, but devilishly effective, break-up of Bognor’s upfield progression. That said, there was plenty of good short-range passing, and penetrative crossing, from our unpretentious hero as well. The workmanlike behaviour is necessary though as Bognor up tempo to try and get back on level terms, with one point-blank header from about 6 yards whistling over the bar. Far be it from me to farm an easy cliché, but it really would have been easier for Dan Beck to avoid the gasps of disbelief and relief on the respective terraces than achieve them so (un)successfully. The plethora of injuries leaves plenty of overtime, during which Bognor manage another great chance, a bevy of tired legs in the H&W box unable to prevent a poke goalward which is swept up swiftly by Colin Matthews despite his having to reach down from his 6’8”. He makes several excellent saves during the final moments of the game but none better than his dramatic swoop in the 95th and final minute. 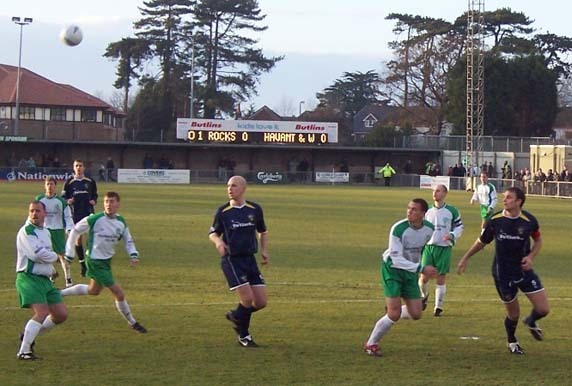 Prolific Bognor forward Ben Watson’s free-kick from 20 yards is launched from a worryingly central position and it’s loft and curve is poetically pin-point, heading into the extremities of the top right hand corner, before Colin’s windmilling tentacles scoop the ball from its glorious trajectory. Had he been 6’6” or shorter, he may well have been left floundering, so while the Hawks fans sing on the immediately subsequent final whistle “we only need ten men”, it is with the caveat that one of those ten should ideally be ridiculously tall. See this is where the Old Testament had it wrong. It is surely better to get the gargantuan freak on side. Why bother with the slingshot, Dave, if you’re in the position to offer fairly reasonable semi-professional terms? While still behind Weymouth, the Hawks nonetheless now find themselves 5 points clear in 2nd place and with plenty of reasons for celebration. The H&W players are applauded vociferously from the field, with the players similarly unwilling to wind up their overhead applause of the bank holiday beano-ites, and as such the victory dance of a verse, chorus and middle-eight of Showaddywaddy’s ‘Under The Moon Of Love’ rings around the swiftly emptying ground.